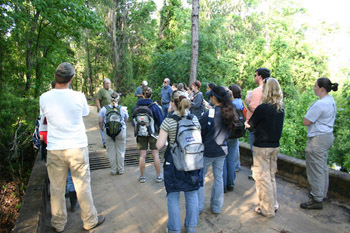 OSBS serves an extraordinary outdoor classroom for college students that are working on a degree that focusses on ecology and the natural resources. The station assists instructors to challenge students to observe natural processes, formulate questions, and think critically about environmental issues. College students have a chance to apply the information they've learned in classrooms and books to real world scenarios. Engage in ongoing resource management processes such as prescribed fire, exotic-invasive species, and habitat restoration.